This week’s spotlight goes to Hale’s Apple Farm. 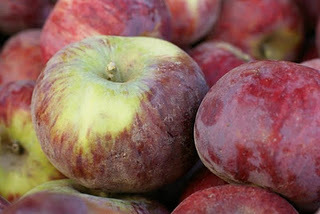 Dave, the (apple)-Jack-of-All-Trades, is bringing 10 varieties to you tomorrow. Ten! Here are some teasers: Sleeping Beauty, Jonagold, Golden Delicious, and Pippin. Come taste all their tart and sweet glory at MCM. 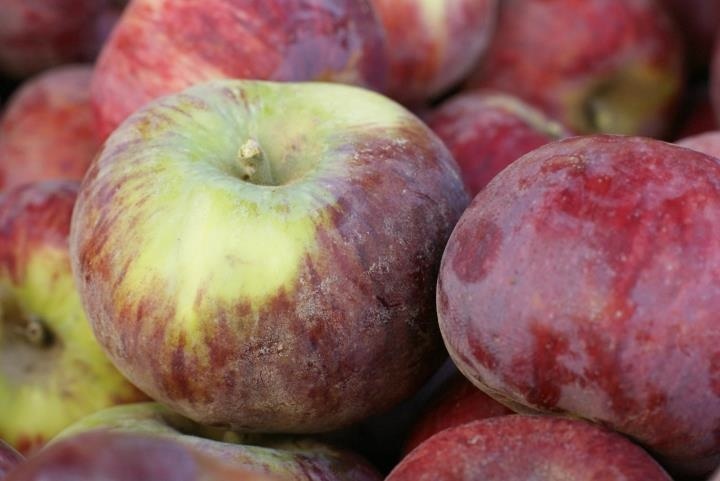 Once you have chosen your favorite, stock up: local apple season does not last forever. Of course they are delicious fresh (try them diced with a dash of lime, salt, pepper, or chili powder), but what to do with your extras once you’ve followed “Doctor’s orders” and eaten your daily dose? Here are some great recipes that freeze well. Prepare now for the holidays! sheet to catch any overflow. In a large pot, saute the shallots in oil for 5 minutes or until soft. Add the curry powder and ginger, and saute an additional minute. Add the sherry, and stir well to deglaze the pot. Add the diced apples, vegetable stock, and apple juice, and bring the mixture to a boil. Cover, reduce the heat to low, and simmer for 20-25 minutes or until the apples are tender. Remove from the heat and allow to cool for 10 minutes. In a food processor or blender, in batches, puree the soup until smooth, and return the soup to the pot. Whisk in the soy/milk, a little of the lemon juice, and season to taste with salt and pepper. If desired, add additional curry powder, apple juice, or lemon juice to the soup to adjust the sweetness or spicy flavor of the soup to your own personal taste. Serve hot or cold.